Many marketing and sales departments are busy finger-pointing and blaming each other for a lack of leads, or good lead follow up. This hurts your business! 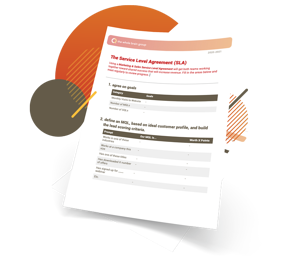 Download our free Marketing & Sales Service Level Agreement template to get them working together to increase revenue. We are inbound marketers focusing on the manufacturing sector, and we love working with companies in security, automotive, HVAC, tool and laser, and more. Grow your business with a lead generation machine that empowers your sales force and levels your competition. Work with us.